35% of adults in the US are obese, but a study published in Frontiers in Psychiatry found that 10% of underweight participants met the criteria for a food addiction . Addiction is typically associated with drugs or alcohol, but research has shown that food addictions activate the same reward and pleasure areas of our brain that substances do [3, 4]. The urge to consume more food in order to gain the same sense of emotional release or comfort. Feeding behaviors are part of a network of neural circuits that include the hypothalamus, the dorsolateral prefrontal cortex, amygdala, striatum and midbrain. These systems regulate feeding behavior and food consumption that is modulated through energy needs and reward and pleasurable feelings . There are various types of symptoms to food addiction, physical, emotional, and social . Physical symptoms of a food addiction are the physical consequences to our body when we overeat. Typically health issues or complications, obesity, diabetes, high cholesterol are just to name a few. Individuals who are underweight, may use extreme fasting, restriction, or purging methods to keep weight low. Either extreme can be harmful to your body physically and create long term medical issues. when an individual has attempted weight loss through various ways and nothing has worked on a long term basis. Emotional symptoms of a food addiction is when the emotions become so severe the person uses food as a coping mechanisms. Often individuals who are suffering with a food addiction typically have prior histories of abuse and trauma, and comorbid disorders . Turning to food can be a source of comfort and numbing to the emotional issues. Social symptoms of a food addiction can include isolation, low self esteem, and poor relationship skills. Often times those with food addictions are eating in secret, and trying to manage feelings of guilt and shame. Many people feel more excitement over food at gatherings than being with people and socializing. Often they want to be left alone with their addiction and begin to pull away from friends and family which can intensify mental health issues such as depression, anxiety, and obsessions . According to Kay Sheppard, a pioneer in the treatment of food addiction, states that food addiction implies that there is a biochemical condition in the body that creates a physiological craving for specific foods. The craving and biochemistry is comparable to that of an alcoholic’s craving for alcohol . Mrs Sheppard goes on to state that food addictions are chronic, progressive disease due to the fact that food addictions never truly go away. It is seen as progressive because more food is needed over time to achieve the same high. Are you spending increasing amounts of money on binge foods? Do you have decreased energy or chronic fatigue from overeating? Do you feel that you have difficulty concentrating? Do you notice sleep issues or insomnia? During the day do you feel restless, have increased headaches or notice more digestive issues? 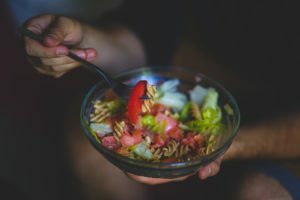 If you answered yes to most of these questions, it would be recommended to talk with a professional therapist or psychologist about your eating and feeding patterns to see if you are struggling with a more serious problem. Food Addiction is typically characterized as a building tolerance to amounts of food, a withdrawal period when binge foods are not available or the person is not able to finish overeating. Attempts at stopping but unable to, or continued relapse, as well as preoccupation and obsession with obtaining and eating food. A noticeable difference in social activities (work or personal), and use of binging/overeating despite continued physical and/or psychological issues because of food addiction [3, 8]. In conclusion, food addiction is similar to that of substance addiction. 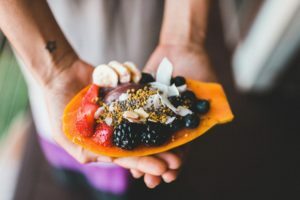 A person struggling needs to seek out treatment from professional therapists and/or treatment center to begin learning and practicing healthy relationship with food. Do you or someone you know have a food addiction? What characteristics do you think make up overeating and a food addiction? At what point would you call eating a food addiction?